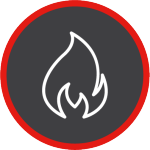 Our Design Team possess a wealth of experience and success in designing and specifying compliant fire life safety solutions. All designers are trained and certificated by BAFE in accordance with SP203 and BS:5839 and are experts in professionally evaluating our customers needs to produce compliant designs with a focus on engineering value added solutions. We have successfully delivered hundreds of new build, refurbishment and upgrade projects of networked systems, PC based graphics, specially engineered control panels and complex cause and effects configurations. Our installation team is vastly experienced in all types of installation. All in house, Installation Engineers hold FIA and BAFE qualifications in addition to CSCS/CCNSG and annual asbestos awareness training. For new build projects we have an excellent understanding of the construction process and the considerate approach and good communications that are required to deliver projects. For existing occupied premises we have a wealth of expertise and proven processes to undertake installations without impacting on our customers operations. All completed installations are certificates under BS:5839 and BAFE SP203. We pride ourselves on submitting compliant designs and undertaking well structured installations with meticulous attention to the highest standards of Health and Safety. We are experienced in programming and commissioning very complex systems cause and effects. This may involve investigation time delays, day/night mode, coincidence/double knock mode and phased evacuation processes, with particular emphasis on the CFOA Policy for the Reduction in Unwanted Alarms and Fire Brigade Attendance. It is our policy to involve the Commissioning Engineer at the earliest stages of a project and gain their vital input in regards to the systems’ commissioning requirements. Our connected approach minimises the time at the time sensitive end of a project. Once the system is commissioned full end user training is given both in the operation of the control equipment and the user’s responsibility for the management and maintenance of the fire detection system.